Launched in 2015, the New Roman & Curtain Collection which includes a sumptuous array of over 350 new fabric weaves & prints to choose from. We offer luxury fabrics (including a stunning tartan & a Velvet range), through to more traditional fabrics such as florals, leaves and stripes as well as contemporary fabrics such as geometric styles. All the colours are available in neutral or on trend colours. 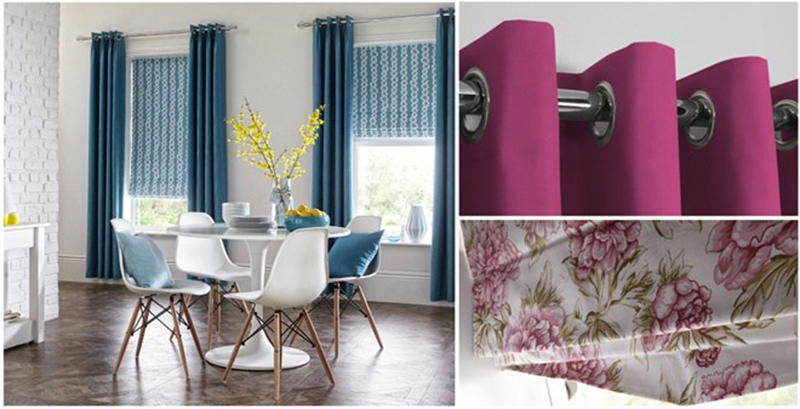 All of our fabrics can be made into Roman Blinds, Curtains, Tiebacks or Cushions. The Roman blinds are all supplied on our Vantage Plus system. The Curtain header types can either be Pencil Pleat, Eyelet, Double Pinch Pleat, and Double Pinch Pleat with Eyelet or Triple Pinch Pleat. Tiebacks can either be fabric or decorative. The fabric tiebacks come in three sizes and can be plain or piped. The decorative tiebacks on offer are Finesse, Excelsior and Vertrobello Embrace. Finesse and Excelsior are decorative rope style tiebacks that come in a variation of colours specifically chosen to complement the fabrics in the collection. Vetrobello Embrace is a clear beaded tieback that is designed to unobtrusively tie in with interior looks yet bring a hint of glamour.